Joining with Amber on Mondays for concretewords, where we practice writing by communicating the abstract through concrete things – a Horse, a book, stairs – and today The Rock. These concrete words posts have led me on a journey through childhood and nostalgia and spiritual maturity – I write and that’s what comes out at the moment. Join me? When I was eight, we went to Cape Town, South Africa. Table Mountain stood solid and majestic, the clouds billowing into wispy tablecloth. At the bottom of the mountain, we watched the gannets circling round, screaming for fish, and we stopped by the sea, wondering where exactly was the spot where the two oceans meet? And could we put our feet in both at once? I could tick it off my ‘to do’ list, my list of achievements in life. Age 8: have been on a cable car to the top of a mountain; walked among the clouds; have stood in two oceans at once. These were the days where we dreamed and built staircases into our future lives. I wore a sun-hat that my grandmother had made; a flimsy pink thing. We ran, my brother and sister and I, feeling the stones and sand beneath our feet and there was light everywhere. This was the land that felt like our true home: these people who spoke the same slang and twang as our parents, the earth that called to our blood. We had a long tour through a gemstone factory, of which I can remember only large glass boxes and wordy plaques, then emerged outside into ‘the scratch patch’. Here we ran in with our 6.00 Rand bags, into the pebbly yard. Except the pebbles were all semi-precious jewels: multicoloured nuggets of treasure, there for us children to tread upon, pick up, throw down, collect and keep. I looked at the fountain in the corner and saw that there were more stones all the time being flung into the yard through a shoot mingling with the water. I flung aside bobbly great turquoises, and the tigers eyes that were just like humbug sweets. I selected some small pink quartz, plopped them into my bag. Then I found it. 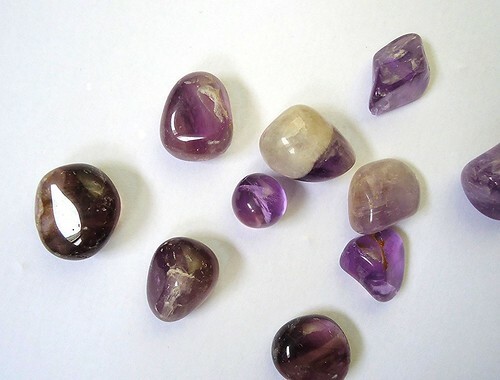 It was a piece of amethyst about the size of my thumb, calm purple with a streak of white. The top was polished and serene, the bottom sheered off, jaggedy. It could not be sold for jewellery so had ended up in the rejects pile. I thought it the most beautiful thing in the world, and the underside was the more beautiful, catching the light in little cube steps. I held it in my hand, and it felt smooth and feisty. At home, I would look at it and hold it: this secret gem that somehow spoke to me of me. I have it still. Do you have an object like that, that you feel symbolises you in some way? Killer last paragraph! I liked it all, but all was elevated at the end: “calm purple” “cube steps.”Lovely. Thank you so much! I love hearing the bits that others liked – it’s really helpful. Beautiful so beautiful. I love going back to the stories of your childhood. It is a privilege. Thank you, Elizabeth! I’m very late, but I’m heading over to read e others now. When I read that you have visited our mountain here in South Africa I was so excited!! Yes, she is truly a beautiful masterpiece from Papoa’s Hand. I hope you are a bit better! I am still praying for you whenever Pappa brings you to my mind. Hang in there, dear friend. Thank you! Yes – one of the most beautiful places on earth, in my book. Girl, you’ve got great concrete words here. It feels like you know a secret, a good one, like a pearl. How can it possibly be Monday again? I love amethyst. And that digging through the scratch patch sounds like heaven. There’s some sort of beautiful metaphor there about being surrounded by gemstones that aren’t quite perfect but must have still been so beautiful.